1. Sailfish sentences net jail (via AP). 2. Gov't appeal of Padilla sentence covered by Herald. 3. Haitian "slave" testifies (via Sun-Sentinel). 4. YouTube taunter pleads guilty (via Sun-Sentinel). The government filed its notice of cross-appeal in the Jose Padilla case. A federal judge has closed portions of Miami's historic downtown courthouse after a report identified widespread mold infestation and ongoing water leaks, with one part of the basement termed "disgusting" by inspectors. U.S. District Judge Federico Moreno, the chief judge in Florida's Southern District, said in a memo that parts of the basement that house court records and a stairwell used by judges were being closed until further notice. "The new steps we are taking may in fact be premature without further microbial testing, but nonetheless we intend to err on the side of caution," Moreno said in the memo dated Friday and obtained Tuesday by The Associated Press. Moreno took action after receiving last week a new U.S. Public Health Service study, which found mold throughout the 166,000-square-foot building that opened in 1933. 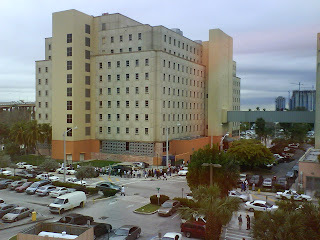 Known officially as the David W. Dyer building, the courthouse is one of several in Miami's downtown federal judicial complex. Across the street, a new 14-story courthouse sits unused, more than $60 million over budget and three years behind schedule. Electrical problems, hurricane damage and contractor disputes are blamed for the delay, which shows no sign of ending. • A leaking toilet above basement space used as a gym by the U.S. Marshals Service has caused suspected mold growth on walls and elsewhere. • Tests revealed a ''significant fungal presence'' in the basement records room, where previously recommended remedial work was never done. Court personnel have had to wear protective gear while in the room, including coveralls, gloves and a respirator. Water damage is present in an area where classified documents are kept. • A stairwell leading to the magistrate judges' courtrooms has visible mold on the walls. The Public Health Service report made 12 recommendations for fixing the mold problem, including repairing numerous water leaks, cleaning air ducts and furniture, replacing damaged ceiling tiles and carpets and throwing out unnecessary contaminated files. Lots of coverage for this trial. Judge Jose A. Gonzalez Jr. is presiding over the trial in Fort Lauderdale because the assigned judge had a conflict. A family accused of keeping a Haitian teen as a slave and abusing her are the victims of an opportunist looking to get residency in this country, defense attorneys said Monday in opening statements. Maude Paulin and her mother, Evelyn Theodore, face federal charges that they illegally brought Simone Celestin into the U.S., kept her in involuntary servitude and conspired to violate her civil rights until the girl escaped in 2005. Paulin's sister, Claire Telasco, also faces charges of forced labor and conspiracy. Paulin's ex-husband, Saintfort Paulin, faces a federal human trafficking charge. Each defendant has pleaded not guilty to the charges. Prosecutors said Celestin was stolen at age 5 from her mother and grandmother in a remote mountain village and forced to pretend she was an orphan at the orphanage Theodore ran with her late husband in Ranquitte, Haiti. Theodore's family got a flight attendant friend to bring the girl to the U.S. on a 29-day visa at age 14. For the next six years, her life consisted of 15-hour work days as an unpaid servant, no schooling and beatings, prosecutors said. "She was never intended to leave this country or their custody," said Cyra Cay O'Daniel, a trial attorney with the U.S. Justice Department. In court documents filed last year, prosecutors identified Celestin as a so-called "restavek," a term meaning "one who stays with" in Haitian Creole. Here's the Herald coverage and the Sun-Sentinel. But defense attorneys painted a starkly different picture in their opening statements, saying Maude Paulin had intended to adopt Celestin but her plan fell apart when she and her husband divorced. They also said family members tried to enroll Celestin in high school, but she only spoke and understood English at the level of a kindergartner. He and other defense lawyers said Celestin may not have been cared for as well as Paulin's teenage daughter, Erika, but she was not treated like a modern-day slave. She received regular meals at home, went to church, watched pop artists like Britney Spears on TV, and went out with boys. They said she did not escape with the help of family friends, as prosecutors contended, but rather ran away because she had grown up and wanted to be on her own. He said local and state authorities were well aware of Celestin's condition during her six years in Paulin's household, concluding she would be better off here than in Haiti. He said federal prosecutors pursued a criminal case after Celestin agreed to testify in exchange for lawful residency. ''In order for her to be here [in the United States], she has to play ball,'' Fenn told the 12-member jury. ''They did not have Simone come on weekends to clean the [Miramar] house,'' DeFabio said. The four defendants might have "appeared ordinary" to outsiders, O'Daniel said, but they hid "a child whose life, will, identity and liberty had been stolen." ...just about everyone thinks the Ben Kuehne indictment is BS. In a last minute deal with prosecutors, the owner of a South Florida charter fishing business pleaded guilty Wednesday in federal court to violating environmental laws by not reporting sailfish reeled in by customers and by killing undersized fish.Prosecutors accused Stanley Saffan, 57, and four employees of coercing anglers to have the illegally caught sailfish mounted by a Broward taxidermy firm in exchange for commissions.The group used high-pressure sales tactics to steer business to Gray Taxidermy Inc. of Pompano Beach, often claiming that because a fish already had been killed it should be made into a trophy, said Assistant U.S. Attorney Thomas Watts-Fitzgerald, who is handling the case. A Fort Lauderdale grand jury indicted Saffan and his crew in July on charges of conspiracy, wire fraud, obstruction of justice and violating wildlife protection laws.The case had been set for trial Wednesday, but the sides agreed on a deal Tuesday afternoon that dropped the government's most serious charges, said attorney Herbert Cohen, who represents Saffan. Under the terms of his plea agreement, Saffan faces up to 10 years in prison. He must forfeit a 45-foot vessel and pay the government 125 percent the appraised value of a 54-foot vessel. Both boats are named Therapy IV. 1. 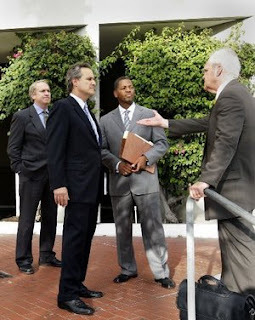 Blogger and now photographer Rumpole details the state courthouse crisis. (At least their courthouse is open). 2. South Florida Lawyer writes about Judge Ungaro's sanctioning of a lawyer. 3. Vanessa Blum has an article about the $4.5 million bond in Dr. Ali Shaygan's case. 5. A note to prosecutors -- keep up to date on your CLE! 1. For Federal PDs and AUSAs only -- this Thursday 2/21 from noon-2pm, the Federal Bar Association (South Florida Chapter) will be having a panel on voir dire, including Judges Huck and Altonaga, AUSA Jeff Sloman, and AFPD Michael Caruso. The seminar is free and includes lunch. RSVP now to Lourdes Fernandez -- Lourdes_Fernandez@flsd.uscourts.gov -- because there are only a couple spots left. The Government was using an informant to feed Kuehne phony information that drug money was legitimate. They ought to hang their heads in shame for prosecuting this man. Every day, American Airlines Flight 914 takes off from Bogota, Colombia, at 8:20 a.m. and touches down at the Miami airport at noon. In the jet's cargo hold are usually bags and bags of euros that investigators say are part of a huge $1.4 billion cocaine money-laundering scheme.Crime is happening right on schedule in Miami, almost every day, federal prosecutors say. But so far, despite nearly four years of investigation, they have apparently been unable to build a strong enough case to stop it.Instead, they are attacking the problem piecemeal. The U.S. Justice Department this week went to federal court in Miami seeking forfeiture of nearly $11 million seized last June and July by federal agents, who used drug-sniffing dogs to find cocaine residue on some of the cash. 3. And here's Vanessa Blum on a doctor charged in a prescription fraud case in which someone died. Could that death have been prevented? Before a West Palm Beach resident died from a prescription drug overdose in June, federal agents received at least two warnings the man's doctor was prescribing drugs irresponsibly and perhaps illegally, according to court records.Dr. Ali Shaygan, 35, of Miami Beach was arrested Monday on charges he wrote prescriptions outside the scope of professional practice and without a legitimate medical purpose. The 23-count indictment accuses Shaygan of causing the June 10 death last year of 29-year-old James "Brendan" Downey.Downey's older brother, Timothy Downey of Wellington, said his brother became addicted to painkillers after breaking his ankle in a 2005 car accident. "Dr. Shaygan is the doctor that prescribed them for him — prescribed whatever he wanted, it seemed," he said. "I think the best thing to happen for society at this point is to get him and every other doctor prescribing pills to these children off the street." Timothy Downey abruptly ended the interview saying he had received a call from someone in the U.S. Attorney's Office instructing him not to speak with reporters about the case. According to Wells, Shaygan was fingered in February 2007 by a drug suspect who said the doctor sold him prescriptions for large quantities of pain medication "with no medical examination. "About a month later, authorities arrested a second drug suspect carrying one-half pound of methamphetamine and a prescription signed by Shaygan. The man said Shaygan would write him prescriptions "for any medication" he requested, Wells stated.Court records do not indicate how those tips were handled. What is clear is that after investigators linked Shaygan to Downey's death, the DEA launched an aggressive criminal inquiry that involved sending two undercover agents into Shaygan's Miami Beach office. Happy Valentine's Day, loyal readers! Well, not much going on in the District the last couple days except that Dore Louis (of Go, Dore, Go fame) was on federal jury duty. I hear that even though he's a former prosecutor, the government struck him! No matter, the jury (in front of Judge Martinez on a misdemeanor case of bringing a knife into a federal building) acquitted in about an hour. Is it really so easy to determine that smacking someone in the face to determine where he has hidden the bomb that is about to blow up Los Angeles is prohibited in the Constitution? . . . . It would be absurd to say you couldn’t do that. And once you acknowledge that, we’re into a different game. How close does the threat have to be? And how severe can the infliction of pain be? If you took a public opinion poll, if all of Europe had representative democracies that really worked, most of Europe would probably have the death penalty today. There are arguments for it and against it. But to get self-righteous about the thing as Europeans tend to do about the American death penalty is really quite ridiculous. Hernando Saravia allegedly gave $1.8 million in drug proceeds to a Colombian kingpin's defense attorney in Miami, but Saravia was not charged in the recent indictment against Kuehne. Instead, Saravia was indicted on one count of money laundering in New York at virtually the same time. The charge stemmed from his alleged attempt to launder $400,000 in drug sales during a New York undercover operation in early 2002. Saravia faces an indictment similar to that lodged against Kuehne and two Colombian codefendants. It's unclear how the two investigations are connected -- federal prosecutors have declined to comment -- but they appear to overlap. Malman, the former prosecutor, said Saravia appears to be working as a witness for the government, starting with the initial New York case in which he was caught trying to launder $400,000. ''Based on my examination of the two indictments, the Saravia case bears the earmarks that Saravia is cooperating with the government,'' said Malman. Saravia, aka ''Bacalao,'' has yet to be arrested in the New York indictment, according to court records. On Monday, the U.S. attorney's office in Manhattan did not respond to a question about his status. Can it really be that the government is going to rely on this criminal's word over Ben Kuehne's? Tell me that's not true. Perhaps the most troubling aspect of this indictment is that it represents yet another instance of the government interfering in the payment of attorney fees for the criminally accused. As opposed to going to court and asking for the fees to be returned as improper, they have opted to proceed with criminal charges that in some cases carry up to 20 years. -- ...But did this DC office investigate the individual charged? Does the fact that 50 lawyers showed up to support Kuehne (see here) mean anything? And did the fact that this top criminal defense attorney (see here) who represented former Vice-President Al Gore make a difference in the DC office bringing this indictment? Clearly the government will say "no" to this last question. But one does have to wonder who has the conflict here? -- Why did the government select to proceed criminally here? Do they really want opinion letters to be considered an indictable offense? Will they be proceeding criminally against government individuals who gave opinions on matters that might be considered illegal? -- If the government knows the source of the funds is improper because of their "undercover operation" would it not be logical that the defense attorney could not know the source of these funds - after all it would mean that the government undercover operation was not working effectively. -- The indictment is preceded by a page titled - "Motion to Seal." It is signed by a "trial attorney - DOJ." It requests the indictment be sealed "for the reason that the named defendants may flee and the integrity of the ongoing investigation may be compromised." - Did the government really believe that Attorney Ben Kuehne would flee? A later sentence states that"many of the named defendants are foreign nationals." But the government fails to limit the language used in the prior sentence that explicitly states "that the named defendants may flee" to only those who might be foreign nationals. That is a powerful statement to claim that a prominent Miami attorney might flee. If they didn't mean to apply this statement to him, is it prosecutorial over-reaching, an attempt to taint the accused, or just sloppy drafting? -- The indictment alleges that Kuehne's opinion letters were inaccurate in stating that some of the moneys had come from an individual/company that "his investigation" "had determined.... were reputable and well-established, without any connection to illegal activities." The indictment claims that some of these opinions were untrue because moneys had in fact come from "undercover law enforcement operations." ---- Isn't the very purpose of an undercover operation to make it seem like things are real? Is this a situation of accusing someone of issuing incorrect opinion letters because the government did a good job of misleading him? A charge without any facts? Did the government actually put a mere restatement of section 1503 as the basis of a criminal charge against an attorney? Co-blogger Peter Henning called the Indictment of Ben Kuehne a "head-scratcher," but that was prior to receiving the document. But after reading it, I'd go a step further - they have actually indicted an attorney for obstruction of justice and alleged no facts in this count to support the charge. It almost sounds like a case the 11th Circuit reversed, U.S. v. Thomas, 916 F.2d 547 (11th Cir. 1990). -- But when an attorney is asked to opine on the legality of funds to pay for the defense of a drug lord, it seems counterintuitive to say the least that he would give his imprimatur knowing that the funds were in fact the proceeds of narcotics transactions that the government was likely to scrutinize carefully. Given Kuehne's pristine reputation, it is hard to believe he would risk his entire legal career for an amount that, while significant, is hardly worth the loss of prestige and income he would suffer from a money laundering conviction. Would you sell your law license and career for a quarter of a million dollars? ...from his immigration prison in Georgia. This is the acquitted defendant from the Liberty City 7 case who remains detained on the same allegations for which he was acquitted. Apparently, the immigration judge told him that there is a difference between being innocent and being acquitted. It's a brave new world; Why have jury trials at all? It's all over the press -- The Herald, the AP, The Sun-Sentinel. Lemorin had a preliminary hearing before U.S. Immigration Judge William A. Cassidy on Thursday. Cassidy was in Atlanta; Lemorin appeared by video from Lumpkin.According to Lemorin, Cassidy said, "There's a difference between being acquitted and being innocent. ""That was very strange to me," Lemorin said. "I always heard that you were innocent until proven guilty, and I'd been found not guilty by a jury of my peers. I asked somebody if he could explain that, but he moved on to something else. It was weird.... There are a lot of things I don't understand. "Immigration hearings have a lower burden of proof than criminal trials. Government documents filed last week claimed that Lemorin was a member of a terrorist group and he was likely to get involved in terrorism if he stayed in the country. "I'm not a threat to the United States of America," Lemorin said. "I love this country. My son and daughter are here, so this will always be my country. "Lemorin's immigration attorney, Charles Kuck, said the full immigration hearing is tentatively set for late May. He requested bond and a change of venue to Miami. "You have the government getting a second bite of the apple because of the way immigration law is set up," Kuck said. He said the case should be a wake-up call for legal permanent residents to get their full citizenship. "Anybody who's not a citizen should be very, very concerned. "Said Lemorin: "The same thing could happen to anybody." Lemorin and his family moved to Atlanta before the government made the highly publicized arrests. ... Because of a continuing gag order, Lemorin could not discuss specifics of his cases, including the concluded criminal trial.The whole thing seems astounding.An acquitted man might not truly be free until he gets shipped off to Haiti. A private attorney has been charged with physically assaulting a federal prosecutor in a Fort Lauderdale courtroom by shaking her hand up and down so hard that it injured her shoulder.Kathy Brewer Rentas spent Thursday night in solitary confinement at the Miami Federal Detention Center. She was released on a $100,000 bond on Friday morning and ordered to get a psychological evaluation to see if she needs counseling or anger management training. "It all stems from a handshake," said Brewer Rentas' attorney, Gwendolyn Tuggle. "In her mind she never intended to cause any harm to any federal official." Brewer Rentas, 49, of Pembroke Pines, went to court Thursday morning for a hearing involving her husband, Anthony Rentas, who is on federal probation for distributing cocaine in New York. Rentas admitted violating the terms of his release.After U.S. District Judge William Zloch ordered that Rentas be put on house arrest for 90 days and complete his probation, court officials said Brewer Rentas insisted on shaking hands with Assistant U.S. Attorney Jennifer Keene. "Keene did not shake Brewer's hand at first, but Brewer insisted that she do so and continued to follow Keene," wrote Deputy U.S. Marshall Robert Kremenik in a misdemeanor arrest report. "Brewer forcefully grabbed onto Keene's right hand and squeezed it, pulling Keene toward her, forcing Keene off balance. With Keene in hand, Brewer made an upward, then a quick downward motion and pulled Keene toward the ground moving her forward, almost causing Keene to fall to the ground," the marshal wrote. Keene's head and neck were snapped forward, then backward, as a result of the force applied by Brewer Rentas, causing Keene's shoulder and arm to be jerked forward, Kremenik wrote. Gilberto Pay, a court security officer, told investigators that Brewer Rentas almost pulled Keene's arm out of its socket. He said he thought it was an intentional act to assault Keene. "He said that it was definitely more than a handshake," according to court records. Brewer Rentas, a commercial litigation attorney for a prominent Hollywood law firm, is charged with a federal misdemeanor. If found guilty, she faces a maximum penalty of up to one year in prison. She could also face disciplinary proceedings by the Florida Bar, the organization that polices attorney conduct. That firm is Becker Poliakoff (I think). And here is her profile (I think). I say I think because I couldn't find a Kathy Brewer Rentas on the Florida Bar website. I could only find Kathy Rentas. Keene was out of work on Friday because of the injury and declined to comment when reached by phone.Alicia Valle, a spokeswoman for the U.S. Attorney's Office in South Florida, said prosecutors are threatened on occasion but an allegation of assault by a licensed attorney in a courtroom is unusual. "Assaulting a federal officer is something that we will take very seriously and prosecute vigorously," Valle said. "As a member of the bar, she should know better." SDFLA blog readers -- assuming the facts as true, what should happed to Ms. Rentas? For the record, I know Jennifer Keene. She is professional and very fair. If someone had asked me to guess which AUSA was assaulted, she would be the last person I would think of. A small luncheon on February 21 for PDs and AUSAs to discuss jury selection with panel of Judge Altonaga, Judge Huck, Jeff Sloman, and Michael Caruso. It's free and lunch will be served. Judge Marcia Cooke to speak at lunch on March 12 at the Banker's Club. 1. The Southern District of Florida U.S. Attorney's Office did not sign the indictment. It recused. 2. Ben's legal team has already filed a motion to ask for an early status conference to address "unprecedented" issues. 3. Lots of coverage around the blogosphere and the press. TalkLeft, AbovetheLaw, Discourse, WSJ. 4. Did Ben's politics have something to do with it? Some have contended that because Ben is a liberal Democrat, he may have been targeted. Others disagree. What do you all think? I note here that I previously posted quotes from Jeff Weiner, a nationally respected criminal defense lawyer who is actively defending Ben publicly and privately. Jeff had one quote in the DBR about his perception about the prosecutor in this case. It did not occur to me that someone -- especially anyone that knew Jeff -- could misread the quote as defending the prosecutor or the prosecution. Apparently, some people did misinterpret Jeff's quote. For that I am sorry, and I wanted to clear this up -- Jeff believes that Ben is innocent and that the prosecution is unjust. He also believes that Ben is being prosecuted because he is a prominent criminal defense lawyer, not a prominent Democrat. The quote from the DBR unfortunately only had this last part and may have left the reader with the wrong impression. I hope this update clears that up. Kuehne's research gave Black the confidence -- in the form of legal opinion letters -- to accept payments totaling $3.7 million in fees and $1.3 million in expenses from Ochoa, according to several sources. Kuehne earned a portion of the expense payments -- $220,000 to $260,000 -- from Black for vetting Ochoa's payments. We all know the real reason for this prosecution -- to discourage lawyers from taking these kinds of cases. I went to court to support Ben. Half of the legal community was there to show their support. (He was released on a $250,000 personal surety bond.) Watching this unfold really stuck in my gut. I am still in disbelief. I actually had a case in the past with the lead prosecutor from DOJ. I went up to him to say hello and he exclaimed without prompting: "This is a wonderful day for the government." The comment was unnecessary and it sickened me. In court, Ben commented to Magistrate Judge Brown: "since I am completely innocent of these charges, I am entering a plea of not guilty.'' He is represented by John Nields and Jane Moscowitz. A bit of good news -- the case was assigned to Judge Marcia Cooke. As I have commented before, she is as fair and just. UPDATED -- here's a DBR story about the case. A good argument for cameras in the courtroom. 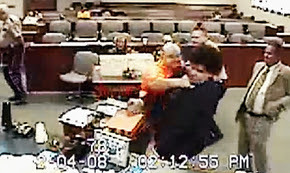 The real action occurs at 7:06 on the video counter, followed by moaning from the lawyer (off-camera). The David W. Dyer building will be inspected today by lawyers and experts for Ted Klein's family. I have been informed that, contrary to recent news articles, the Judge did *not* order the cleanup to stop. Instead, he simply permitted the plaintiff's team in the building before the 6 month period for filing a federal tort claim act lawsuit ran. "Absolved of terrorism, Haitian still in limbo"
Jay Weaver's article on Lyglenson Lemorin's plight can be read here. Lemorin is the acquitted defendant from the Liberty City 7 case who remains jailed by imimgration authorities based on the same conduct even though he is a lawful permanent resident with no prior convictions. Ana M. Jhones, an attorney for alleged ringleader Narseal Batiste, told the new, racially mixed jury of seven men and five women that the FBI agents and prosecutors sought to build a case at any cost against the men from Miami's impoverished Liberty City neighborhood. "This was about desperation - desperation to justify something that never happened," Jhones said in her opening statement. "We have a fabrication, a setup, of six young black men from Liberty City." Prosecutors, however, said the FBI was right to aggressively follow tips that the group was discussing the overthrow of the U.S. government through the bombings and forming alliances with Islamic extremist groups. Although the men never obtained any weapons or explosives to carry out any attacks, prosecutors said the crime was in their agreement to do so. "They had the will, they had the heart, they had the soul to do harm to this country," said Assistant U.S. Attorney Jacqueline Arango. "All they needed was assistance, and al-Qaida was that ticket." According to documents that were unsealed Thursday, U.S. District Judge Richard W. Story — sitting in the Miami case — issued the order Monday to preserve evidence in a case that was brought by the children of deceased Magistrate Judge Ted Klein. Klein died of a mysterious respiratory illness that his family believes was caused by years of working at the old courthouse building. "There is a reasonable risk that material evidence located in and around the David W. Dyer Federal Courthouse, relating to a future claim by the Kleins, against governmental entities and/or private entities, will be modified, altered, mitigated, destroyed and/or remediated and that such change will significantly prejudice the Klein family, causing immediate, irreparable and continuous harm because the contaminants, toxins and/or other evidence will be permanently lost," stated Story's order. Story also authorized Klein family attorney Alan Goldfarb and his experts to "inspect, photograph and videotape" the Dyer Building.